Gov. 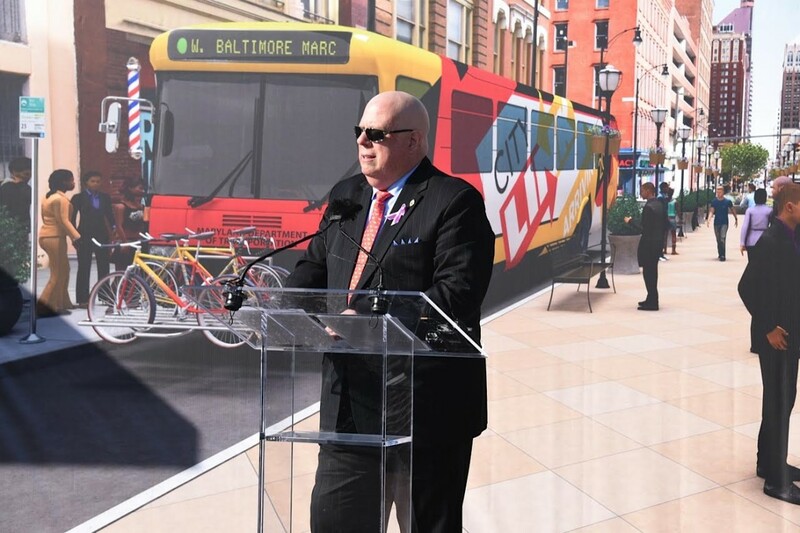 Larry Hogan on Thursday announced a $135 million investment to improve, expand and connect the transit system in the greater Baltimore area. Hogan said that the current performance of the transit system is “notoriously abysmal,” citing slow buses and long routes that ensure people cannot get from their home to work conveniently. The new plan will create a unified and connected Baltimore transit system, called BaltimoreLink, which aims to improve the city’s current bus system, link with other modes of transportation and provide access to 745,000 jobs, according to the Maryland Department of Transportation. The transit plan includes efforts to increase efficiency of bus transit, creating east-west and north-south bus lanes as well as hubs to connect transit and improve access for riders and bicyclists. Part of the transit plan is CityLink, 12 color-coded and high-capacity bus routes, which will run every 10 minutes during rush hour, and every 15 minutes at other times. CityLink will connect riders to Amtrak and light rail stations, as well as job centers like Johns Hopkins University and Amazon. The CityLink system will allow riders to get from one stop to another another with only one transfer, according to information provided by the Maryland Department of Transportation. Not everyone was impressed with Hogan’s unveiling, with some officials saying it fell short of revolutionizing the Baltimore transit system. “Baltimore is woefully behind other cities in public transit, and this plan does little to advance it,” Baltimore Mayor Stephanie Rawlings-Blake said in a statement. “Governor Hogan’s proposal does little for the citizens of Baltimore who are in desperate need of forward-thinking transportation services to increase their access to jobs and better health care, childcare, and educational opportunities,” said Rawlings-Blake, who was not at the unveiling. Pugh also emphasized that the new plan needed to be mindful of the school children, who, she said, make up one-fifth of the transit ridership. To further improve the speed of the transit system, buses will be outfitted with sensors, which correspond with similarly outfitted intersections to shorten the wait time at red lights or hold a green light as a bus approaches. The new transit design efforts are data driven and will expand the transit system by 30 square miles, adding an additional 10 buses, said Paul Comfort, administrator for the Maryland Transit Administration. Ed Cohen, a Baltimore resident and advocate for transit riders, said the biggest issues the Baltimore transit system faces now are stranded riders, because of bus overcrowding, and lack of connection between different points on the transit system. There were previous failed attempts to fix Baltimore transit, Cohen said, so he plans to wait and see how the system connects to decide whether it is an improvement. In June, Hogan nixed a light rail line planned to run through Baltimore, saying the design would cost nearly $3 billion and fail to integrate with the city’s existing infrastructure. The “Red Line” was planned to run from Woodlawn to Johns Hopkins Bayview Medical Center through Baltimore. The “Red Line made no sense whatsoever” and was one route, while the new plan is more comprehensive, Hogan said. The Maryland Transit Administration expects to implement the new transit plan, including launching CityLink, by June 2017, according to the timeline from the Maryland Department of Transportation. The Maryland Transit Administration will begin public workshops in November, focused on educating residents about the plan and asking for their input. The new Express BusLink service, five new routes connecting suburbs, will launch in June 2016. Related Post: Transformative transit or Plan Blech?